PORTLAND, Ore. (AP) DeMar DeRozan credited Toronto’s second unit for Portland’s ugly second quarter. 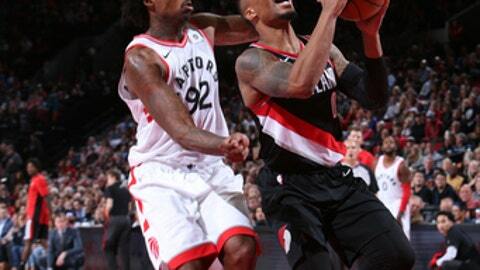 The Trail Blazers were held to just six total points – Evan Turner’s layup and four free throws – in the period and Toronto went on to win 99-85 on Monday night. DeRozan had 25 points to lead the Raptors, who were up by as many as 26 points. Kyle Lowry added a season-high 19 points and added 10 rebounds. The win extended Toronto’s winning streak over Portland to five straight games. Damian Lillard had a season-high 36 points for the Blazers, who got within 13 in the final quarter. CJ McCollum, who had scored 20 or more points in each of Portland’s first six games this season, had 16. Toronto was without center Serge Ibaka, who is averaging 15 points a game this season, because of swelling in his right knee. The knee started to bother him following a victory over the Lakers in Los Angeles on Friday. Jacob Poetl took his place in the starting lineup. The Raptors also missed Jonas Valanciunas for a fourth straight game with a left ankle sprain. Toronto’s focused on defense throughout, coach Dwane Casey said. DeRozan had 15 points in the first quarter and the teams were knotted at 29 going into the second. DeRozan led the Raptors with 24 points in the 101-92 victory over the Lakers. The Blazers went cold in the second quarter. Really cold. They went 0-for-16 from the field until Turner’s layup with 5 seconds left before the half. Portland’s other four points in the quarter came from free throws and the Raptors led 54-35 at the break. The Blazers’ six total points were a franchise low for the second quarter. Going back into the first quarter, the Blazers missed 20 straight shots over the miserable stretch. Lillard hit a pair of consecutive 3-pointers and a layup in the third quarter, but the Blazers couldn’t make up much ground. The Raptors led 81-61 going into the final period. Portland went on a 10-5 run to open the fourth and close the gap to 86-71 with 8:55 left. Lillard added a 16-footer to cut the margin to 13. Portland was coming off a 114-107 win at home over the Suns on Saturday. Raptors: It was the fourth game of a season-long six game road trip for Toronto. … The Raptors won both games against the Blazers last season. Trail Blazers: Portland’s lowest point total for any quarter is five points. … It was the last of a four-game home stand for the Blazers. … Meyers Leonard is currently out because of right lateral ankle sprain. … It was the 76th 30-point game of Lillard’s career. QUOTABLE: ”The first quarter was really nice and the second quarter was really bad.” –Stotts. Toronto plays the Nuggets in Denver on Wednesday. The Trail Blazers visit the Utah Jazz on Wednesday.